Sir John Mandeville' is the fictitious author of a fictitious journey to the Holy Land. The account of his travels was probably written, in French, in northern France c.1356. This copy was written in England and belonged in the Middle Ages to the Augustinian Priory of the Virgin Mary at Bolton, Yorkshire. It is written on parchment of mediocre quality, in mediocre script: a book intended for use rather than as a luxury status-symbol. 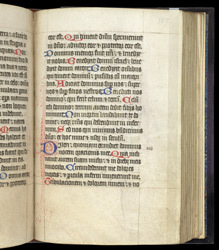 After the end of the text, at the bottom of this page, is a three-line inscription mentioning 'the lady house at Bolton' (2nd line), dated 1425 (3rd line).